I read on Twitter today that this week is Tinnitus Awareness Week. An estimated 10% of the population suffers from Tinnitus and yet many people have never heard of it. To find out more about what it is, how it affects people, how to manage it and who to contact for help if you think you might have it, visit this superb post from Jenny. This week is Learn to Sign Week. 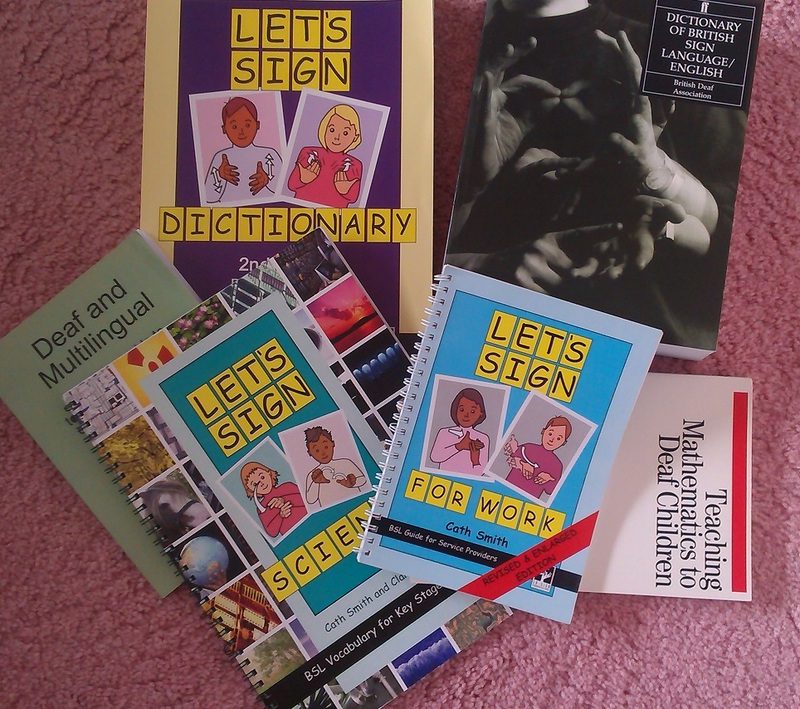 I spent 3 years learning BSL in Adult Education classes, and I’m lucky to work in an environment where I use it regularly, so my sign language is competent (although I need to brush up on my receptive skills), but if you don’t sign at all – where do you start? If you want to learn to sign fluently, your best bet is to enrol on a BSL Level 1 course, but if you just want a few basics there are plenty of options available to you. A useful first step is to learn fingerspelling. If you have children they may well have learnt it at school, or at Brownies or Scouts, so they may be able to teach you. If not you will find a free download of both left and right-handed fingerspelling at Deaf Books. After this you could learn a few greetings in BSL – there are various YouTube videos you could watch: Good Morning, Please and thank you, and a few more greetings/introductory conversation. A BSL dictionary is a great investment, and this one is ideal for beginners. My last suggestion is for those of you on Twitter – you could follow @BritishSignBSL for a new sign every few days. If you feel confident after these basics, why not add your support to the Life and Deaf “Good morning” campaign. I came across this post recently at limpingchicken about what it’s like to be a deaf learner. It’s a great insight into how difficult and tiring it is. Deaf Awareness Week – What Can You Do? Today is the last day of Deaf Awareness Week 2013, so it’s time to look at how you can be more Deaf aware. First of all, to gain the attention of a deaf person, tap them lightly on the shoulder and then wait for them to look at you. If you need to gain the attention of a roomful of deaf people, flash the lights, and wait for them to look at you. That’s great. You’ve got their attention. Now what? Contrary to popular misconception, not all deaf people can lipread. Lipreading is a skill, and it’s actually incredibly difficult. Stand in front of a mirror and say, “cot dot hot lot not”. Can you tell the difference between them? It’s not easy is it? Now imagine that you are trying to follow a whole conversation just by watching someone’s lips. Some Deaf people I know are very good at it – my old BSL teacher was so good she could lipread from the side! – but others find it difficult or impossible, so don’t assume that they can. If you know that the person you are talking to can lipread, make it easier for them. Always stand in good light. Never stand with your back to a window as this puts your whole face in shadow and makes it difficult to distinguish your features. Be aware that not all deaf people can read or write. Of course these skills are taught in schools, but they are not easy to learn. For most of us, we learn our first language purely by being exposed to it. We hear our parents and wider family speaking it. We hear it on the TV or radio. We hear it spoken in shops when our parents take us out in prams or pushchairs. Imagine if you hadn’t had that exposure. Imagine if you had to learn to read without having any idea what sounds the letters made. Would you have found it so easy? For many Deaf people, English is not even their first language – those born into Deaf families may have BSL as their first language. Think about what your school life would have been like if your parents spoke English, and then when you went to school your teachers spoke only Chinese, and all your books were written in Chinese. It’s really not surprising that some deaf children leave school without being able to read or write. In short, don’t assume that you can communicate with a deaf person by speaking slowly for them to lipread, or by writing things down. So, what can you do? How about learning some BSL? Many adult education centres offer a short (about 6 weeks) introductory course for just a few pounds, where you will learn the basics such as fingerspelling,numbers and introducing yourself. You could also follow @BritishSignBSL on Twitter to learn one new sign a day. Once you have a few signs under your belt, have a go, and don’t be afraid to mime things to get your point across. Throughout Foundation Stage (Nursery and Reception aged children are mixed together) children are exposed to both English and BSL. Some of the teachers have English as their first language, and some have BSL as their first language, so the children have good models for both languages from the very beginning of their schooling. The children can choose whether to speak or sign – some do both, some neither, but none of them are forced one way or the other. The thinking is that by exposing them to good examples of both languages at this young age, even if they choose not to use them, they will have a better understanding in KS1 when more formal teaching begins. In Year 1 the children begin formal Deaf Studies. One of the staff with BSL as their first language leads the lesson. In the session I observed, the children first practised their fingerspelling – spelling their own and their classmates’ names. After this, the teacher gave the children a picture story and they took it in turns to sign the story as best as they could. When they had all had a go, the teacher signed the story herself, demonstrating how to add extra details and to use facial expressions. Some of the more confident children then had a go, using some of the additional features they had picked up from the teacher. The whole lesson was taught in BSL. Storytime in Year 1 takes place in both languages. In the morning the children have a story which is read in English but with a few signs to support understanding. In the afternoon they have the same story but told entirely in BSL. Higher up the school, Deaf Studies includes playing memory games, and practising lip-reading skills as well as BSL. Children are also introduced to some of the gadgets that will be useful to them in later life when they are old enough to live independently. They are taught about smoke alarms that cause their house lights to flash instead of beeping. They are taught that they can have their doorbell connected to the lights so that they flash when someone rings the bell. They are taught about vibrating devices attached to alarm clocks that they can put under their pillow when they don’t have mom and dad to wake them up anymore. One of my favourite lessons was watching the Deaf adults teaching the children how to use FaceTime so that their social interaction doesn’t have to stop when they leave the school premises. Related posts: Numeracy in a School for the Deaf Deaf Awareness Week – what can you do?